First off – just relax! There is an Ibiza sound system is playing all day, and you can chill just about anywhere in the grounds. In the courtyard there are hammocks and a classic game where you have to throw metal chips into a frog’s mouth. Reconnect with family and friends – away from your PC or Tablet screens! Use your grey matter on the other side of the house where you will find a giant chess board with pieces. Teach the kids all the chess moves. All activities are subject to pre-booking and availability. Confirm with us now to avoid disappointment. We have a full-size pizza oven on site in the lower floor of the Barn. 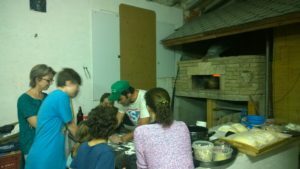 Organise some dough (from the local bakers in La Secuita) and with a pre-arranged group of 8 or more Ricard will demonstrate how to fire the pizza oven, use the home grown veggie produce and bring your own toppings. Help Ricard collect some wood for the oven too. Great fun for a big group.